Students from Marjory Stoneman Douglas High speak to the media inside the Florida capitol. 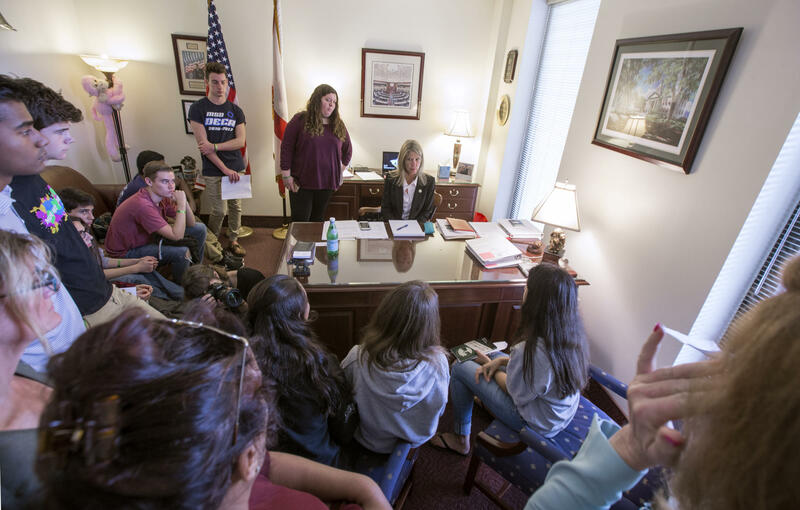 Florida Sen. Debbie Mayfield, center, listens as student survivors from Marjory Stoneman Douglas High School tell their personal experiences in her office at the Florida Capitol in Tallahassee, Fla., Feb 21, 2018. 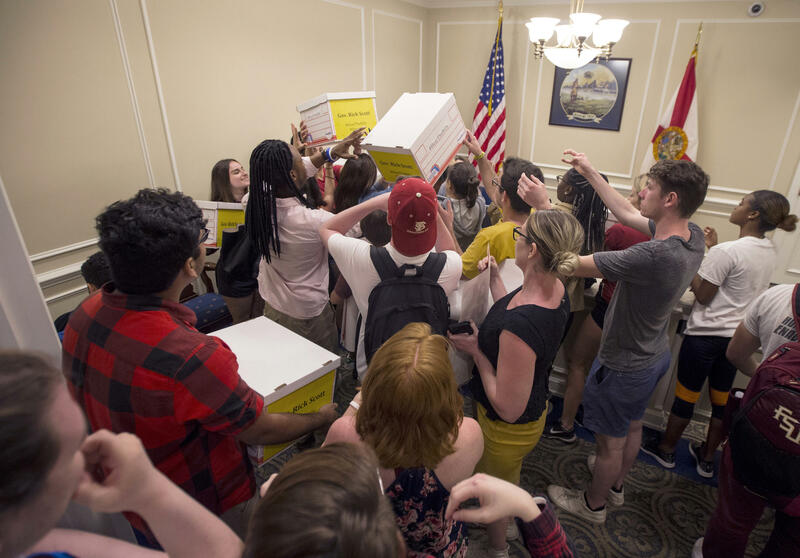 University students pass around boxes of petitions for Florida Governor Rick Scott in the governor's office inside the Florida Capitol in Tallahassee, Fla., Feb 21, 2018. More than 100 survivors of one of the nation’s worst school shootings spent the day advocating for changes ranging from stricter gun laws to metal detectors, demanding that state lawmakers take swift action to prevent another tragedy like the one that left 17 people, including 14 schoolmates, dead. 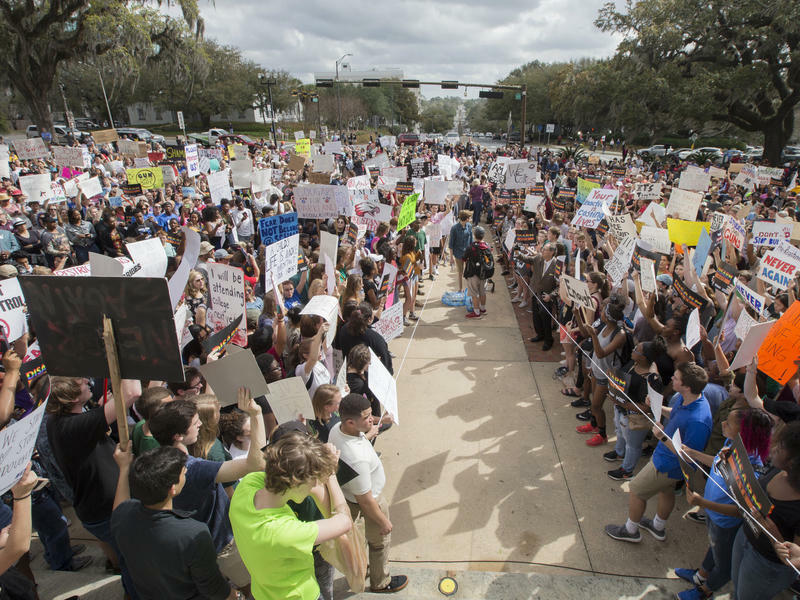 The students traveled by bus Tuesday to Tallahassee, sleeping at the civic center before arriving at the state Capitol about 8:30 a.m. Wednesday and meeting in groups with a wide range of legislators and other officials, including Gov. Rick Scott, Attorney General Pam Bondi, Education Commissioner Pam Stewart, House Speaker Richard Corcoran and Senate President Joe Negron. While the students’ main focus was on gun control, the teenagers --- several of whom gave impassioned speeches at a midday press conference --- also begged lawmakers to quickly pass measures to make schools safer in other ways. “We will not be discouraged. We will not falter. We will not stop this movement. This is more than just us. This is everybody in America. This is for every single kid who fears for their life. This is more than Parkland. This is more than Florida. This is more than the United States. This is something serious. It is about human lives,” Alfonso Calderon, 16, said at the press conference. Nearly all of the students attended a meeting with Corcoran inside the House chamber, where Madison Leal gave a tearful description of how “my high school turned into a horror scene” after Nikolas Cruz opened fire on faculty and students with an assault-style rifle on Feb. 14. Leal said she hid in a closet for hours, crying and texting, unaware of what was happening outside her classroom. Republican House members Jeanette Nunez of Miami and Jim Boyd of Bradenton, along with Coconut Creek Democrat Kristin Jacobs and Sen. Lauren Book, a Plantation Democrat who helped organized the bus trip, joined Corcoran in promising the students that they would pass some legislation to protect students before the legislative session ends on March 9. “This has overshadowed everything. This has become our priority. I cannot say it enough: We will not fail you,” Nunez pledged. Many of the students questioned why state lawmakers would not support an outright ban on assault-style rifles like the one used by Cruz, who legally purchased the weapon, with no waiting period, last year. “It’s widely used in multiple different scenarios,” the speaker said, adding that “we’re having a conversation about it” and that he has six children. “I don’t think there’s bipartisan support for it,” Corcoran said. While students politely raised their hands to be called on during the meeting with Corcoran, the teenagers were more confrontational shortly afterward as they stood at the podium facing dozens of television cameras and members of the press from around the world. “We are not here to be patted on the back,” 17-year-old senior Delaney Tarr said. Tarr said she and her friends are angered by politicians who “dance around our questions,” reminding lawmakers that many of the students will soon be able to vote. The students had mixed reactions to their reception by lawmakers. Leal said she disagreed with Corcoran about the ban on assault weapons, a demand that was the focus of a large rally outside the Capitol on Wednesday. “I think there should be a ban on semiautomatic rifles, but I understand why there is such a big controversy with that. I think that he’s on our side, and I am praying that he’s on our side. I’m praying that we can all trust him, and change will be near,” she told The News Service of Florida after the Corcoran meeting. Ryan Deitsch, a senior at the high school, criticized legislators for “political doubletalk” on the gun issue. “I can vote, and I know who I’m not voting for,” Deitsch said. The students have channeled their grief, anger and frustration into the #NeverAgain movement, sparking walkouts in schools throughout the nation and intensifying the already-raw issue of gun control in Florida and elsewhere. “It’s just so hard to come up here and see all these senators talk about, well, you know, what can we do. What can you do? You could have helped us when we needed it. But instead you didn’t. Instead, there are stars of David and crosses sitting in front of Marjory Stoneman Douglas High School because of their failure. Law enforcement failed us, and so did the Legislature this past week, and I think that’s something that needs to be recognized,” Beau Simon, a 15-year-old who attends Cypress Bay High School in Broward County, told the News Service. Scott on Tuesday said he intends to roll out a legislative package by Friday that would, among other things, require schools to hold active shooter drills, “significantly increase” funding for school safety and mental health, and make it harder for people with a history of mental-health problems, like Cruz, to have guns. Scott also wants to make sure people under age 21 can’t purchase long guns or rifles and impose waiting periods for the purchases of rifles, similar to current restrictions for handguns. The House, too, will release a proposal before the end of the week, Corcoran told reporters Wednesday afternoon. One element of the House plan would likely allow school districts to use trained personnel to bring guns onto campuses, something similar to undercover U.S. marshals who provide security on airplanes, according to Corcoran. Like Scott, Corcoran said the House wants to increase funding for school safety officers and school hardening, items the Senate is also considering, along with $100 million for mental health screening and services. “Whatever that amount is, we will pony up the money” for the additional safety measures and services, Corcoran said. The speaker praised the students’ advocacy, despite their skepticism. Sofie Whitney, an 18-year-old senior from Marjory Stoneman Douglas High, was among the students who capped the day by meeting with Scott. The students spoke about the need to make gun possession more difficult for people with mental-health issues and a need to raise the age restriction on the purchase of assault rifles. “He seemed really receptive, but we’re not going to be sure of any of his actions until he proposes the bill on Friday,” she said. Sen. Dennis Baxley, an Ocala Republican who has been the sponsor of many NRA-backed bills, also met with a group of students late Wednesday afternoon. He told the News Service they discussed his proposal would allow some people with concealed-weapons licenses to bring guns to schools. 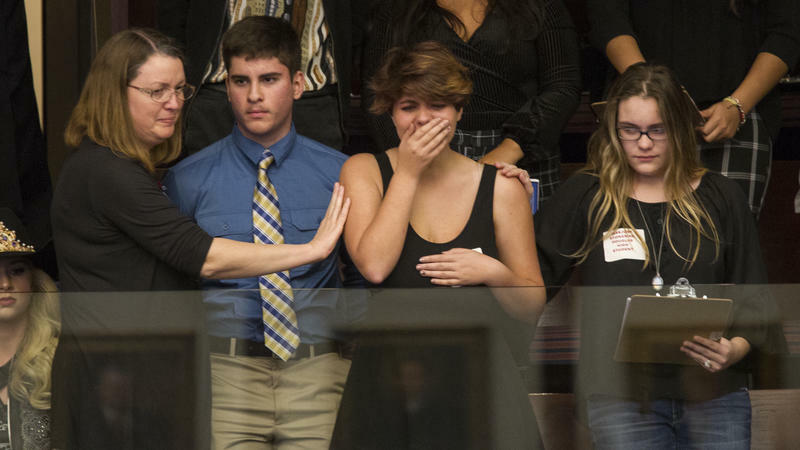 A week after a mass shooting at a Broward County high school, survivors and gun-control advocates demanded Wednesday that state lawmakers enact tighter gun and school-safety laws as a rally drew one of the largest crowds at the Capitol since the 2000 election recount.